Dark gray or green above, with sky-blue tinges shading to silvery and white below, numerous distinct round black spots on back, extending to the dorsal fin and tail. No barbels and no scales on the soft dorsal fin. One or two prominent canine teeth usually present at tip of upper jaw. Seatrout are found inshore and nearshore in and around seagrass meadows, mangrove-fringed shorelines, deep holes and channels and above oyster bars. Spawning occurs inshore from March through November. Spotted setrout move into deeper, still waters during colder months. They feed on baitfish, mullet, shrimp and crabs. Free-line live shrimp or small pinfish or pigfish (grunts) near the bottom to entice trout out of grass-bed holes. Attaching a float will allow these baits to drift over the grass beds as you search for trout. Casting with soft-bodied jigs, top-water poppers and spoons can be effective. Trout are very delicate, so returning unwanted or illegal fish promptly to the water is necessary to maintain a healthy population. Spotted seatrout are a good eating fish. 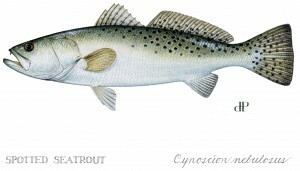 Spotted seatrout reach 3 feet and 15 pounds but are common in the 4-pound range.